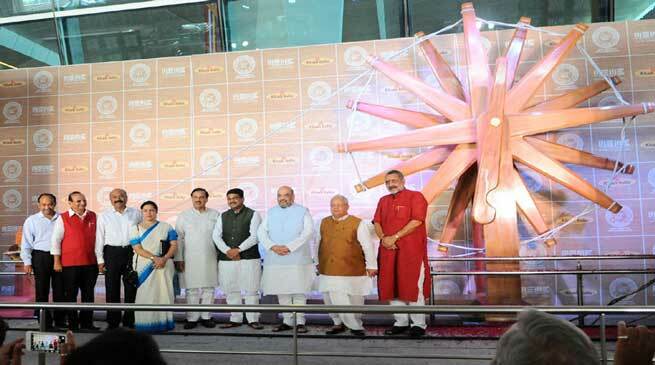 World’s largest Charkha (spinning wheels) unveiled today by Shri Kalraj Mishra, Union Minister for MSME at the Terminal 3 of IGI Airport Delhi. The idea behind displaying the world’s biggest charkha at the country’s “busiest airport” is to highlight India’s quest to foster an egalitarian society as demonstrated by Mahatma Gandhi, the father of the nation. The four-tones Charkha made from high-quality Burma teak wood is estimated to last for over 50 years. It is 9 ft wide, 17 ft tall and 30 ft long. It was built in 55 days by a team of 42 highly skilled carpenters hailing from Ahmedabad. Charkha, like the memorial to unknown solidiers, is memorial to the unknown rural masses, who heard the call of the father of the nation and took to the demonstrated ways of self reliance and dignity of labour. When we celebrate Charkha, with deep regards, we pay tribute and respect to the Khadi artisans symbolically. Prime Minister, Shri Narendra Modi in a message for this occasion said “The Charkha is a symbol of our glorious heritage, and an inspiring reminder of our freedom struggle, led by the father of the Nation- Mahatma Gandhi”. PM further said that he was sure that the Charkha will serve to remind travellers at the IGI airport of India’s timeless heritage and the values of sustainability and harmony that it stands for. Unveiling the Charkha Shri Kalraj Mishra said that the Charkha is the symbol of Gandhian values and shows the Government’s priority to Khadi and Village Industries in the country. He added that Charkha represents Swadeshi, self-sufficiency, and at the same time interdependence, because the wheel is at the center of a network of cotton growers, carders, weavers, distributors, and users.